Now I’m going to show you how to set IPv4-TCP/IP protocol with Netsh command-line tool in Windows Server 2012 R2 or Windows 10 Operating system. 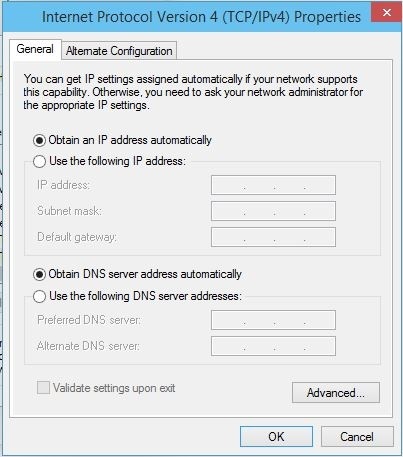 In the GUI environment, we can easily set or change IP to a NIC. Ok, run cmd or Powershell as administrator, Netsh work in both command prompt and Power Shell. I’m using Windows Powershell. Now you see tow interface cards. Ethernet0 with index id 3 is the physical interface we should set IP and configure it. Type: Netsh interface ipv4 show config Ethernet0. You can set index IP instead of the interface name. It gets IP address from APIPA (automatic private IP address). To set new IP address type: Netsh interface ipv4 set address name=Ethernet0 static 192.168.10.15 mask=255.255.255.0 gateway=192.168.10.1 and press enter and type: netsh interface ipv4 show config 3. to see if it work correctly. You can adjust the default gateway separately by typing: Netsh interface ipv4 set address name=3 gateway=192.168.10.1 and press enter. It can set default gateway but may reset the IP address to APIPA like below screenshot. Now try to set DNS Server IP address with: Netsh interface ipv4 set dns name=3 static 192.168.10.10 primary and press enter. It shows an error but works correctly. The error is the lack of DNS Server, if there is a DNS server, we will not face with any errors. By default ICMPv4 (echo request) is disabled and you can’t ping to the system. To enable it by command line just type: netsh advfirewall firewall add rule name=ICMPV4 protocol=icmpv4 dir=in action=allow. To see if it is enabled or not yet type Netsh advfirewall firewall show rule name=icmpv4 and press enter. Ok. That’s all you must know to configure IPv4 IP address of Windows Server 2012 R2, Windows 7,8,8.1 and Windows 10. So good luck.